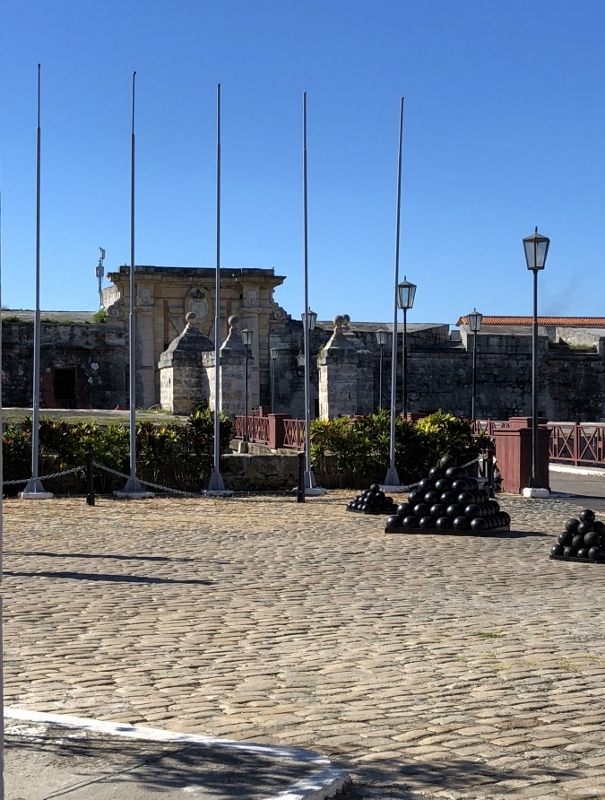 Founded in 1519, Havana, by the seventeenth century, became a shipbuilding center for the Caribbean and a center for trade, To protect the harbor the Spanish began building fortresses. 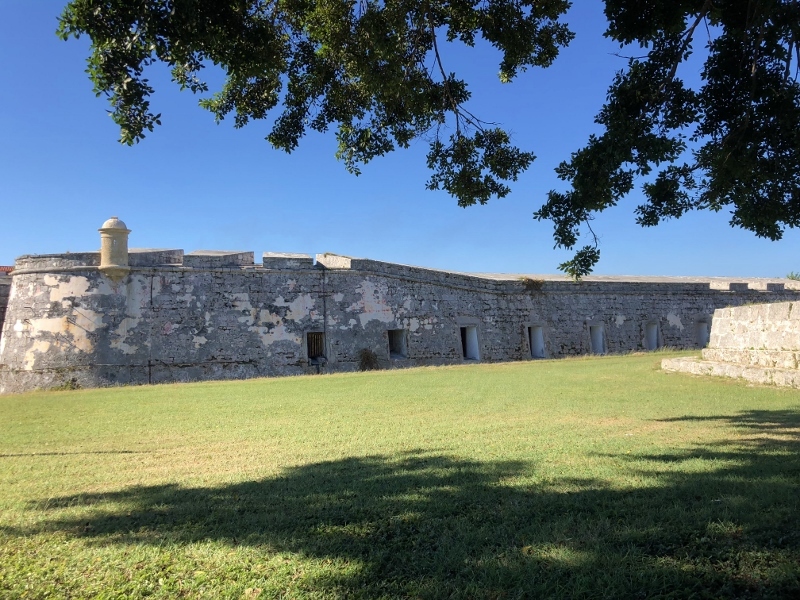 We passed by a small one at the entrance to the harbor and then not too farther on, a very large one called Fortaleza de San Carlos de la Cabana. 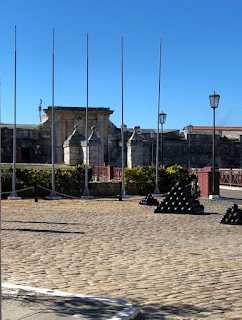 On our Highlights of Havana tour our bus wound its way around to the fortress for us to get a close up look. Unfortunately our tickets did not include an inside look but we were able to explore the courtyard outside the fortress and of course, as in all good Caribbean excursions, were given an opportunity to shop. 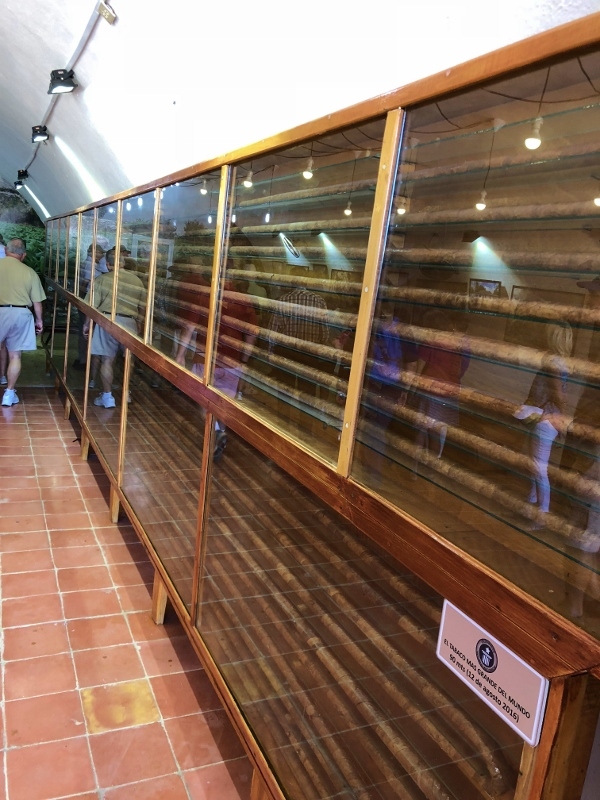 First our guide took us into an exhibition room with pictures that explained the process of growing, harvesting tobacco and then rolling the leaves into cigars. Along one side of the wall were some of the world's longest cigars. Jose Castelar Cairo holds the record for rolling the longest cigar. It measured 295 feet and was rolled in 2016 to commemorate Fidel Castro's 90th birthday. There were lots of other hands involved in the rolling but Jose engineered the whole thing. I can't imagine how long it would take to smoke it. Next to the tobacco room and down a few steps was a shop where you could buy cigars, rum, and coffee. It was obviously on our approved OFAC list or we wouldn't have been directed to it. If I am understanding all those rules correctly, it meant that money spent there was not going directly to support the government. Our guide had hinted that Jose Castelar might be there but instead of the man for real, we got a real likeness of him in the form of a wax figure standing behind a table that held tools for rolling cigars. 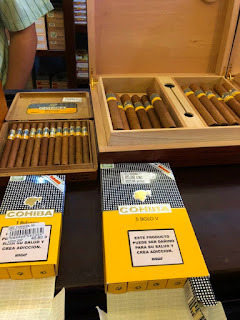 Walking into the shop you immediately smelled the tobacco in the cigars--a much nicer smell than a burning cigar although Bob and I have fond memories of that smell from our grandfathers and fathers smoking them. We wandered through quickly and went back outside. It was a crammed space with all those people. Outside we climbed up to a spot where we thought we could get a view inside of the fort but it was not possible. There was a nice view of a lighthouse though. Our last stop of the tour was at the Christ statue that stands above the harbor entrance. While not as large as the one in Rio, it is still quite impressive. It was designed by a woman sculptress, Jilma Madera. 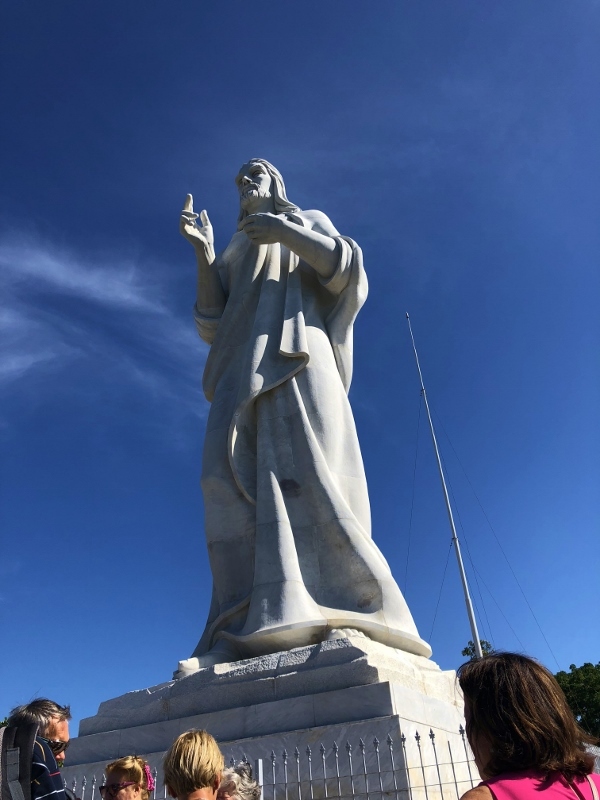 The story goes that Batista's wife commissioned the statue in the hope of protection for them. 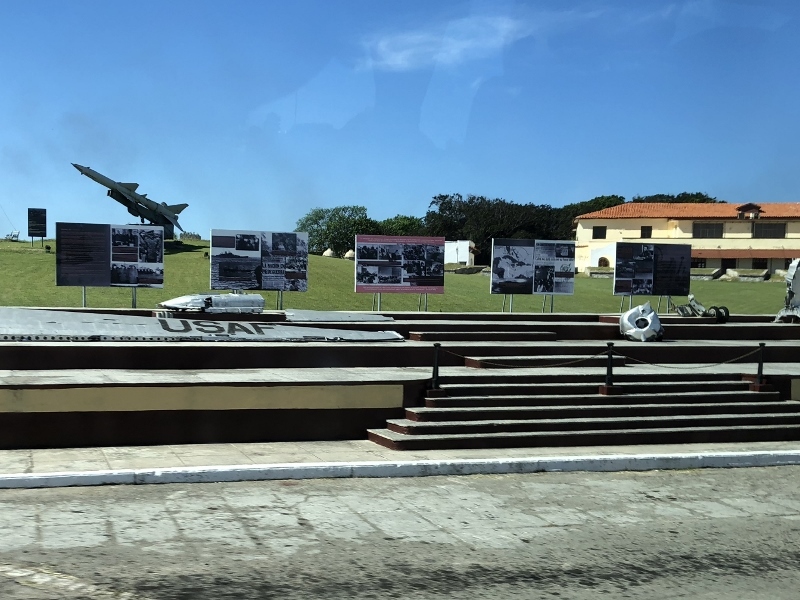 Fifteen days after the sculpture was installed and dedicated, Fidel Castro entered Havana and Batista and his family fled. A sign by the statue that explained its origin said that the pieces were sculpted in Rome and each blessed by the Pope. 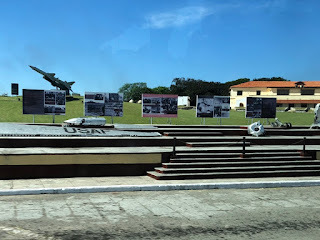 While we lived a lot of the history that was going on in Cuba and involving the US, neither Bob or I recalled a U2 plane being shot down but as we left the statue we passed by some sort of military base or museum and displayed near the road were the pieces of the plane that were recovered. I looked it up. Yup, we did have a spy plane shot down over Cuban waters. It happened during the Cuban Missile Crisis in 1962. There had been several missions flown that had taken pictures and confirmed the build up of Russian missiles in Cuba. On this mission, the Soviets ordered the plane shot down with a surface to air missile. The pilot, Air Force Major Rudolf Anderson, was killed. Our return to the ship was as complicated as getting off. Several times our passports were checked along the way and again our bags went through x-ray machines and we walked through metal detectors. And yes, this time my new knee set it off. I pointed to it and the girl ran the wand over it and it went off. Without a smile she just waved me on.